The celebrities hit the red carpet last night for the SAG Awards in high fashion. Designer dresses, billowing fabrics, purses that cost your mortgage and oh so glamorous bling. Sparkly cocktail rings, diamonds cuffs, delicate necklaces and more adorned stars, but the big jewelry trend was drop earrings. Take a look. Sarah Hyland sparkled in Me & Ro gold and black diamond jewelry. The standout piece was the drop earrings. Kyra Sedgewick chose a very similar pair. 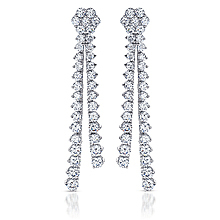 Also opting for drop earrings was Angela Kinsey from the Office, with a pair from Chopard. Kim Kardashian chose giant, statement drop earrings. You can crib their red carpet look with a pair of your own. Here are just a few similar styles.